﻿Price, Deposit, Welcome Puppy Package and Puppy Delivery Options detailed below. The puppy colors I raise are Black, Salt/Pepper, and Black/Silver ONLY. All my puppies go to their new homes at eight/nine weeks old with the Puppy Welcome Package detailed below. All of my parents are OFA health tested and certified for their Heart and Patellas. 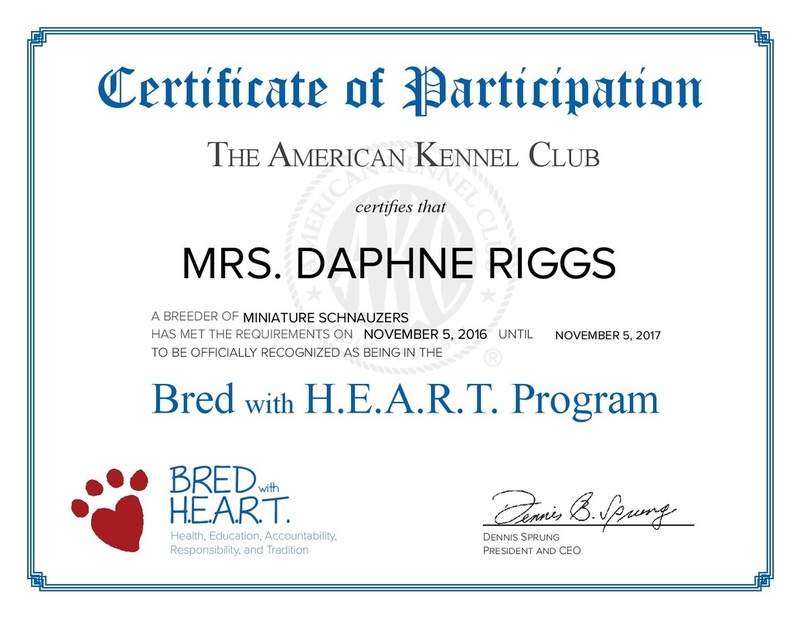 I am also a Club Member of the AKC Bred with H.E.A.R.T Program which includes continuing breeder education. I am also adding Embark Genetic Health Testing for all my adults starting the summer of 2018. My mission as a Miniature Schnauzer Breeder is excellent health, friendly temperaments and beautiful coats and coloring. Raising Miniature Schnauzers is a serious commitment and my families future happiness means a great deal to me. To reflect my commitment and dedication, I have a five-year health guarantee against genetic diseases that are life threatening (i.e. heart valve defect and OFA certification regarding this defect with all my parents). Please keep accountability in mind when searching for a responsible breeder. All of my Schnauzers and puppies receive routine veterinarian care at the Bluffton Animal Clinic in Bluffton, Indiana. My puppies also get PUPPY ENRICHMENT TRAINING. You are welcome to give my veterinarian clinic a call as they have known me for decades. I spare no expense with the care of my adults and puppies. When you come here to pick up your puppy, you meet the parents too. DEPOSIT POLICY: There is one condition when the deposit IS refundable but otherwise this is a non-refundable deposit. *The deposit is refundable if the Buyer came for a visit (puppy pick-up) and my Home/Schnauzers are not to the standards I have set on this website (which will not happen). I do understand that sometimes the BUYER cannot get a puppy as planned but your only options are to move to a future litter or to forfeit the deposit. REMAINING BALANCE DUE DATE: the remaining balance is due before the puppy turns four weeks old if you placed a deposit prior to the birth of the puppy. If you place the deposit AFTER the puppy is born, the balance is due at SIX WEEKS old. I do not keep puppies past the eight/nine week pick up date, unless absolutely necessary. Boarding fee is $10 a day. Please plan your schedule around the pick-up date, thank you in advance. Payment options are a personal check, cash, paypal, or credit card online. THE TOTAL PRICE: regardless of gender or color is $2200.00 which includes the Puppy Welcome Package detailed below (the deposit is $600.00 which leaves a remaining balance of $1600). If you would like to get two puppies (together) the price for the second puppy is $2000 ($400 deposit with a remaining balance of $1600). Puppy Application and serious applicants only please. Payment Options: You can pay by personal or a cashiers check or a money order--payable to Daphne Riggs. *I no longer take paypal or credit cards but I will make an exception, if we discuss the details and the fee that paypal charges first. * TAIL DOCKING: The tails are docked & dew claws are removed by my vet. If you want the tail undocked you will need to be first pick on a litter for your specified gender. The puppies will not have their ears-cropped, I do not ear-crop and my vet does not either. If you want the ears cropped you will need to arrange the procedure with your vet. * TWO VETERINARIAN EXAMS & 1st VACCINATIONS: The puppies get TWO veterinarian check-ups, are vaccinated with the first puppy booster and are microchipped by eight weeks old. My vet also performs a physical exam before the puppies go home which includes checking for no heart murmur, lungs are free of abnormalities, no ear or eye infections, glands are normal, teeth and gums are in perfect condition for the age and no parasites such as fleas, ticks, intestinal worms or mites (if for some reason the puppy were to test positive for a parasite after they leave here, let me know ASAP). Your puppy will go home at a healthy weight, proper nutrition and well-hydrated. * INTESTINAL PARASITE PREVENTION: I give my puppies Strongid-T at 3 week old and Panacur at 5 and 7 weeks old. I take in a stool sample to my vet prior to the puppies going home (the sample goal is to be negative for worms, coccidia and giardia). The worming brand Panacur treats for roundworm, whipworm, tapeworms and hookworm. All dogs should be treated regularly for worms as the eggs live in the soil for weeks to years and you never know what areas are infected. Tapeworm comes from flea bites. Not all wormers treat for all four worms but Panacur and Drontal Plus cover all four.​ To my Puppy Families: Please let me know ASAP if your vet gets a positive stool sample result. This is unlikely with the worming precautions that I take but it’s still slightly possible to get a positive stool result at a later date. * FLEA AND HEART WORM PREVENTATIVE: The puppies are treated with K9 Advantix II and Heartgard to protect against fleas and heart worm before leaving my home. I have had 100% NO fleas to date. This treatment is good for 30 to 60 days depending on your area and the flea and mosquito population. * MINI-PUPPY GROOM (potty patch, trim corner of eyes, feet pads and nails) AND EXCELLENT HYGIENE: All puppies are bathed, puppy groomed and have a nail trim before leaving to their new homes. They also have clean ears that are free of infection. They are freshly bathed just a few hours before they go to their new home. * SOCIALIZED: Puppies are socialized with other pets and in a family environment -- they are home raised and well-adjusted when you take them home (the first 24 to 48 hours in a new home they may go through a small adjustment period). I spend a lot of quality time playing with the puppies and making sure that their transition from my home to yours goes smoothly. Please review my PUPPY ENRICHMENT TRAINING. Between my parent's nice temperaments and how I work with the puppies before they leave, they have a solid foundation to be wonderful adult dogs. However, it is up to you to continue training and nurturing a well-balanced puppy/dog or you can turn them into a monster--your choice. What you do regarding positive socialization outside the home and training has the biggest impact on them as they grow into adulthood. * ISO MICROCHIP: All puppies are Microchipped with prepaid enrollment for life. The ISO is an international chip and superior to other types. All you do is set up your account FOR FREE @ www.akcreunite.org. This service has no annual fee. * TOYS AND MORE: Every puppy is sent to their new home with THREE TYPES of TOYS, A PLUSH/WASHABLE BLANKET, TEETHING CHEW, BALL, PUPPY TRAINING TREATS, PUPPY FOOD and a SLICKER BRUSH. * FOLDER WITH RECORDS: All puppies receive a vaccination record from my vet which will be in a folder along with other papers. The folder will also contain the health contract, spay/neuter contract, AKC reg papers, microchip information and tips on critical fear periods. I also send EIGHT puppy training emails prior to the puppy going home. * FIVE YEAR HEALTH CONTRACT: All puppies are covered under a Five-Year Miniature Schnauzer Health Guarantee and Contract, which covers genetic diseases that are life threatening (such as heart valve defects). This does not cover accidents, non-life-threatening issues or neglect by owner. * BREEDER SUPPORT... when you have questions for me or need helpful advice, I will be available, within reason. This is a very important part of breeding. New families often need advice and information as they adjust with a new puppy. I do hold you accountable for training failures and/or confusion though. The puppy is YOUR responsibility. Do you live far away? I have a few options below for travel and puppy delivery. DRIVING:﻿ ﻿We can meet half way within reason or I can deliver the puppy to your home if it's within our range. I will deliver or meet up to a maximum of a 400 miles round-trip (200 miles one-way). The fee is .35 cents per mile. Example, a 100 miles is $35.00 or the maximum 400 mile trip is $140. Wit and I flying TOGETHER to meet his new family. I do NOT Ship puppies and here is why... SHIPPING PUPPIES is not the same as flying with the puppy in the cabin which is how I travel with puppies/dogs. Breeders who SHIP puppies are sending them in the cargo hold with the luggage and they charge anywhere from $350 to $500. The puppy is shipped in the cargo hold with no caretaker available and no one to be accountable for any issues once you pick up your puppy at the airport. How does shipping a puppy work? Puppies are checked in at the airport luggage drop and they are then treated as luggage and travel with the luggage--not with people. They sit outside on the loud tarmac waiting to be loaded before the flight with the luggage. During the flight the puppy is literally in the bowels of the plane and these flights can be anywhere from 6 to 18 hours (direct flights are dangerous enough however connecting flights hold even more risk). The plane is only temperature controlled while in flight. It gets very hot and can be very cold between flights and while waiting for the plane to take off. The sound of the plane is deafening/frightening in the cargo hold, sitting on the tarmac waiting to be loaded is also dangerous and if there is a delayed flight or mechanical issue the puppy has no one there as they wait in the bowel of the plane or on the tarmac not to mention temperature fluctuation risks. The breeder is also not at the airport to meet you in order to be accountable if there is an issue once the puppy arrives or if the puppy fails to arrive at all or if it is the wrong puppy. Lastly, I want to meet ALL of the families in person. I personally fly with the puppy in my constant care and they remain in my care the entire trip. As soon as I book the flight I forward that information to the family in an email. I hand deliver the puppy directly to you at the airport and we sign the paperwork in person and go over the puppy welcome package together. ​I have a better option which is personal delivery safely from my care directly to yours. You pay the $500/$800 fee once the pregnancy is confirmed or within the first week after birth. I can provide receipts as well. I do NOT overcharge for this service. Puppies are at least 9/10 weeks old when they fly out with me. 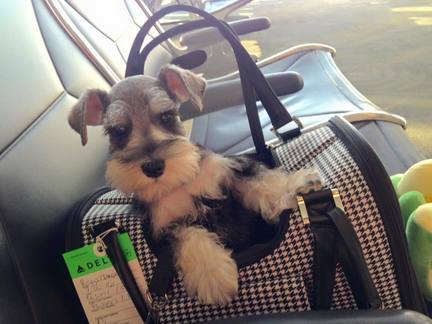 You may also contact families that have had me hand deliver a Schnauzer to them at the airport. I know you will be very happy with this option if you live to far away to drive here. Meeting halfway is not always convenient either, so flying is a wonderful option. ﻿I think it's safe to say that most of us are not rich, and we all appreciate a good deal. Why not? Blowing money unnecessarily is just a waste, and most of us enjoy finding a bargain even if we can afford to spend more. When shopping for cars, electronics or furniture; frugal living is the way of the wise these days. So, why the big deal about shopping around when looking for a puppy? The price that you pay for a healthy well-bred puppy is minimal compared to the cost of raising, owning and the veterinarian costs for the life of a dog that's ill-bred and sickly. Ever heard the saying, "You get what you pay for"? Yeah, well, the pet dog industry is one place you won't find a better example of the prudence of that advice. Quality in the breeding world can range anywhere from absolute crap to jaw-dropping fantastic and everywhere in between. And although it may not always be this way, in most cases you're going to get exactly what you pay for. Quality has never been cheap and buying a quality puppy definitely is not! You are going to have to expect to pay more than just a few hundred dollars to buy from a responsible breeder. It is important to remember though that just because you are paying a large price for a puppy it does not mean it is quality (testimonies from happy families is very important). There are several factors that go into the price of buying a puppy from a good breeder and make sure the breeder is doing all of these things or more. The ever increasing price of top notch veterinary care is one of the main reasons (all my adults and puppies receive regular vet care). Breeders like myself pay state and local taxes even though I am classified as a Hobby Breeder. I invest in quality Schnauzer puppies to bring into my program (and I pay for full-registration and I often travel up to 14 hours one-way), high quality diets, pre-natal exams, pregnancy x-rays if needed, supplements, emergency veterinary care, c-sections, assisted whelpings when complications arise, vaccinations for adults and the puppies, health testing, routine blood-work, dental cleanings, veterinary exams/health checks for each puppy at least twice, food, heartworm, flea meds, worm meds, puppy food, dog food, toys for my adults, cleaning supplies, bedding, dishes, crates, grooming supplies, my welcome puppy package, AKC registration of my adults and puppies and more! If you can imagine this is just the short list of my costs but it gives you the idea! My time... do not forget the time invested in working with families, caring for puppies and adults, cleaning, etc. Well bred dogs are expensive to breed. Even poorly bred dogs are not cheap to breed. The dam may need a c-section for the birth that can cost $1,500 or more. Plus there is care for the dam during pregnancy and after birth. If they do it right there is health/genetic testing before breeding. The average litter can cost $2,500+ or so to breed by the time all is said and done. If there is only 1 or 2 pups in the litter even at $1,500 the breeder is often taking a big loss. Any purebred dog is going to be expensive if the breeder is investing in their program. When you purchase a dog through a reputable breeder, you have to remember that the breeder has already spent a good amount of money on veterinary care for the mother and the pups and that is reflected in the price of the puppy. Pre-breeding health checks for both parents, stud fees, prenatal care, initial vet visits, shots, wormings, food, and all the other things that the breeder takes care of long before you ever get to bring your puppy home--these things cost a lot of money. I personally spare no expense for my Miniature Schnauzers! Add to that that a responsible breeder rarely breeds a female more than once a year. Now divide all those expenses by the number of puppies and even at $1,500 most Responsible breeders are lucky if they break even. It has been said that exceptional quality is not expensive, It's PRICELESS! It is estimated that the average breeder spends 180 hours or more per month caring for their dogs and pups. This 180 hours cannot be scheduled around other obligations; other obligations must be scheduled around your puppies and adults. Have you considered what a breeder needs to do to go away for the weekend, a vacation, or even the day--I have to have reliable people stay at my home 24/7. So, having a litter of puppies for any breeder pretty much takes a considerable chunk of time and independence from your life. A good breeder will carefully screen and interview all potential buyers to ensure that their puppies get placed in only the best homes. They will also offer support to the puppy's new family to make sure that they are properly prepared to care for the puppy and they will stay available to help out any family in need, even if it means accepting the puppy back into their home if problems arise. Look at your well bred Schnauzer as an investment in your emotional health, you couldn't get any mental health professional to treat you daily for the next 12 to 15 years for $2000. Good puppies start long before their parents are bred. Both the sire and dam need constant care and conditioning to produce the best offspring. This means regular veterinary care, screening for genetic problems, pre-breeding health tests, regular exercise, family environment and good nutrition.